Some things get better with time. But they're rare. THE WORLD (Rixstep) -- There are some very weird rumours circulating right now in the MAC COMMUNITY, one of which - by far the most controversial - is that MacOS is no more. Based on loose innuendoes and asides from the likes of David 'Pogueman' Pogue and Rixstep, these rumours hint at another operating system having taken MacOS' place. Although presently unconfirmed, these rumours - if proven to be true - would indicate a great many users will have to 'go back to school' and otherwise adjust once more - and worst of all abandon their lifelong computing habits with their beloved MacOS. 'UNIX' sports something known as a 'command line'. This 'command line' is used in place of the superior Macintosh Graphical User Interface. If Mac users are forced to use this 'command line', chaos and mayhem may result. There is one way around the current dilemma however: CLIX 1.7.2f 'f'. 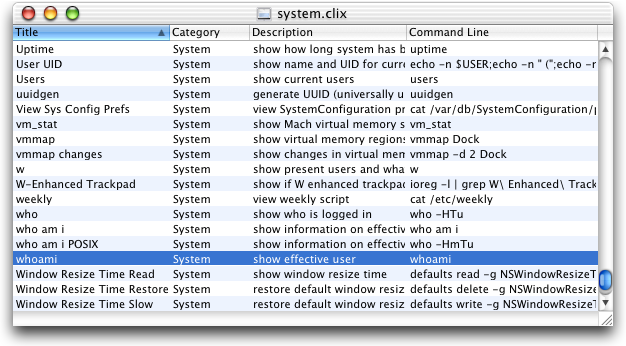 'CLIX' is a program, not an alternative operating system, and all it does is assemble often-used 'command lines' in an accessible Macintosh Graphical User Interface so keyboard use is kept to an absolute minimum. This makes it possible for even the most advanced Macintosh user to accomplish necessary tasks while running the operating system 'UNIX'. Barring a return to the beige box, this seems to be the best option for all. 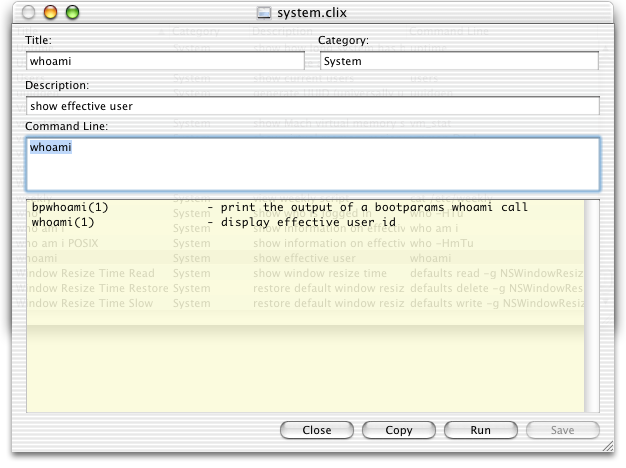 CLIX works as a standard multi-window document-based editor. It edits 'CLIX documents'. These documents are records of 'command lines' together with descriptions of what the 'command lines' do. All the user has to do is click the 'Run' button to make things happen. Following are screenshots of a typical CLIX user session. Figure A. 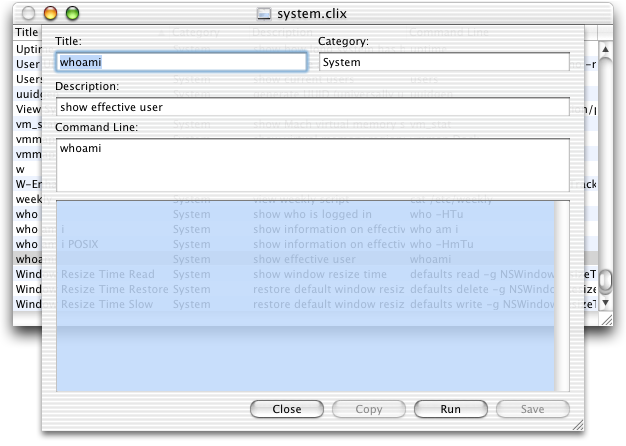 The user has opened the CLIX document 'system.clix' and is poised to activate the 'whoami' command. Figure B. 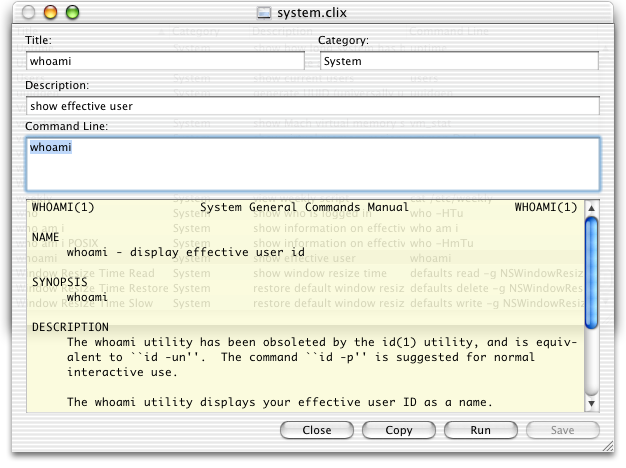 The user double-clicks the 'whoami' command, releasing the CLIX command sheet. The fields in this sheet are (theoretically) editable. Figure C. The user option-double-clicks the word 'whoami' in the 'Command Line' field to invoke documentation for the 'whoami' command. 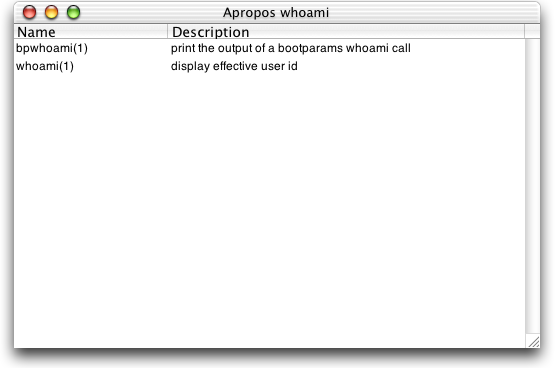 Figure D. The user command-double-clicks the word 'whoami' in the 'Command Line' field to invoke 'apropos documentation' for the 'whoami' command. Apropos documentation lists all references to 'whoami' found anywhere in the 'UNIX' operating system. Figure E. The user connects the 'ManOpen' system to CLIX and 'apropos documentation' appears on screen in the Macintosh Graphical User Interface. 'ManOpen' is a program written for an operating system called 'NeXTSTEP'. Although not 'UNIX' per se, 'NeXTSTEP' is similar and its programs can often run on 'UNIX'. 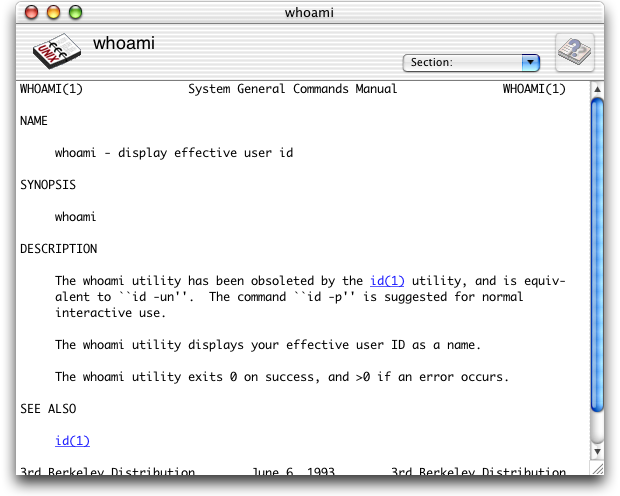 Figure F. The documentation for 'whoami' appears on screen in the same Macintosh Graphical User Interface. With all this help, the user is now much closer to finding the answer to 'whoami'. The codename for CLIX 1.7.2f 'f' has been 'f'. It is highly optimised; as soon as Apple release their 'rev B' Intel laptops it should be 'universal' as well. It has on its way to 1,500 commands for your diversion, erudition, and general entertainment. And it is available now.